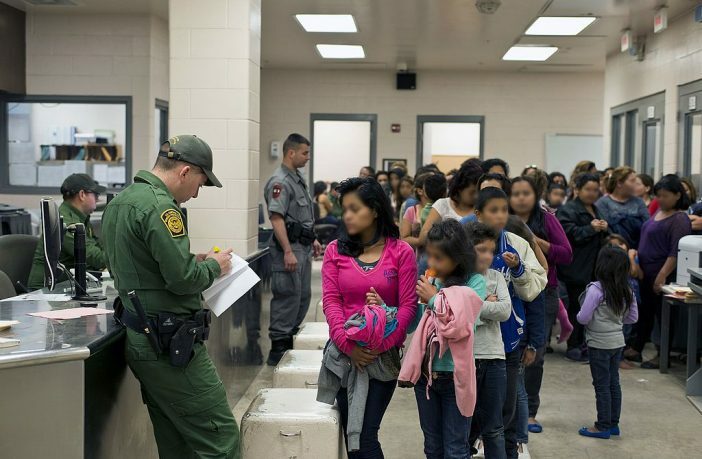 Before President Donald Trump’s Department of Homeland Security got serious with a Zero-Tolerance policy, children served as get-out-of-jail-free cards for border crashers. Families were routinely released with a notice to appear in immigration court at a future date. They rarely showed, and melted into the general population of illegal aliens. Not surprisingly, some among the latest wave of migrants say they put children in harm’s way, figuring that the presence of their young charges would gain them an earlier release. Others admit to posing falsely with children who are not their own. Border Patrol officials say such fraud is on the rise. Who’s sliding down the moral slippery slope now? Border apprehensions of adults bringing children skyrocketed during the Obama administration, from about 15,000 in Fiscal Year 2013 (the first time separate statistics were reported) to more than 75,000 in FY 2017. Now, dodging the thorny matters of familial responsibility and the exploitation of minors by profiteering human smugglers, craven politicians and credulous media outlets raise the grim specter of childhood “concentration camps” in America. It’s time for a reality check. According to one news report, the federal government spends $34,660 annually on each unaccompanied minor. That’s three times what the U.S. Department of Agriculture estimates American middle-class families spend on their youngsters, and multiple times more American children in poverty will ever see. Heeding the echo chamber of criticism against the DHS family separation policy, Sen. Ted Cruz, R-Texas, proposes increasing the number of immigration judges to expedite hearings at the border. The Justice Department is already on the case, dispatching new judges to tackle an ever-lengthening docket. But those who swallow specious moral platitudes and bow to manipulated media do a disservice to the nation – are compromising the rule of law and inviting more chaos at the border. “Demanding that border-jumpers bringing children with them should be exempt from prosecution is a sure-recipe for even more children to be smuggled through Mexico and to the Rio Grande,” notes Mark Krikorian of the Center for Immigration Studies. Actually no, it isn’t but it is unnecessary and expensive. What should happen is the illegals and their children if any should be marched back across the border immediately and released. Those caught here a second time should be summarily executed. The tactics that these “migrants” are employing is a particularly lowly instance of morally unacceptable barbarian invasion technique known as “human shields”. It is particularly lowly because the original use of the said tactics by the invading hordes involved captured relatives of the defenders as the human shields, while now the modern invaders use their own children (or children of their compatriots) for that purpose. Think about it: do you want these opportunistic people who resort to such morally unacceptable (in addition to being illegal) actions to become your neighbors, your travel mates, your co-workers, and your fellow Americans? (I don’t.) They are not going to change just because they hopped the border. Just look what they and their compatriots did to their countries of origin – they are likely to inflict the same kind of damage to ours. Expensive it is. When that money could be used in a better way. When the kids are going to have better than in mexico. How many millions of dollars are paid to deport and for jury or whatever? How many kids are separated from their parents that go to war and never return? And aren’t doing anything illegal. What are we doing but paying their way back Deport and legal fees and so much more rather than enforcing the laws and let them know we have LAWS. Thank you, Buck! Where is the outrage over the kids, such as Justina Pelletier, being forcibly removed from parents, who did nothing wrong, and subjected to abuse and torture? The left believes that parents have no rights (“It Takes a Village”) so you are absolutely right calling this border disorder “faux moral outrage”. I can see social services agencies nationwide salivating at the prospect of having all these new victims to “care” for, and get paid for. So send them back across the border to the southern most border of Mexico. If they want to be with their children. Mexico has already offered them asylum they just want the American dream given to them. Free medical, room and board. Yes tell them they just need to go back and come in the right way. Real Americans are treated worse than these illegals and they are forgotten. I mean the ones that are homeless sleeping in tents , boxes, under bridges, and yes they exist all over the United States. They don’t know where their next meal is coming from. It may be in a dumpster near you. Oh yes many wait until Mc. Donalds, Burger King or many other business’s close for the night just to get their next meal. Why don’t we worry about them first before these illegals. Ok remember I said keep their families togeather just send them back across the border to do it right. We do not owe immigrants anything and if they can’t help our country we do not need them. The American: In America ( as well *** ALL other Countries) if a “parent” commits a crime, they will be “separated” from their children. It is called JAIL! Crossing ANY Countries Border without proper visa is a CRIME, oh YES that does include AMERICA! You idiot moron! Sentence 2: Why are we comparing entering the US to being jailed for a crime? It is all called BREAKING THE LAW, it used to be “if you broke the law, you went to jail”. You might have to read real slow so to understand this. Answer 2: Not a comparison. Entering the US by avoiding legal entry points is a crime for which one is jailed. Those who enter through legal entry points are not jailed, ergo not separated. Because illegally entering the US is a crime moron. Wow, is the US going to be managed now by the illegal immigrants? What about happened to the law against harboring illegal aliens? I am sure, the US citizens who will harbor them will serve time and unable to join their children in jail while the illegal aliens are being supported morally and politically. Whatever happened to the US Constitution? Is it now the law for the illegal aliens and by the illegal aliens? Aren’t the Democrats not realizing, that we, the US Citizens are working so hard to make ends meet and we are taxed for every penny we earn while monies are disbursed to the illegal aliens tax exempt? Just confused where we are headed in the future, am I still able to collect SSC? The gov keeps on raising our age to collect SSC, so that illegal aliens can be accommodated first. We, the US Citizens are deprived to collect SSC. We can’t afford to live on SSC if we retire at 60 years old, that is why so many retirees who make up to $1500 live outside of the US to be able to afford decent rental houses or apartments with minimal utilities and food consumptions. The gov can track down how many retirees have opted to leave the US, and the make less income than what we provide each illegal alien (child or adult). The amount of media time spent on this issue, which is 95% anti-Trump, is vastly out of proportion to the attention paid to it under the Obama administration. Even local stations are doing long segments on it, which they never did back then. As noted, a lot of these people are bringing children who are NOT THEIR OWN, essentially making human shields out of them to gain what they want. The real question that should be asked is if these people are willing to bring children not their own, what happens if those children become a drag on their desert crossing. Leave them if they become inconvenient? Or once they were allowed entry into this country and released with those children, what is the incentive to care for those children now that they have served their usefulness. Not my worry anymore. A lot of people have made the observation that this has been actually going on for several months but now it dominates every news cast at the same time little attention is paid to the report of the Inspector General of the FBI, who was questioned by a House committee today. Rep. Trey Gowdy made a damning rebuke of the claim of “no bias” against Trump. He pointed out the numerous statements by lead investigators of the Clinton e-mail issue and the Trump collusion investigation, who happened to be the exact same people. There were numerous texts about how Hillary ‘has to win” and one text by the lead investigator who said “we will stop him from becoming president”. That is not a mere statement of dislike, but can only be read as taking some kind of action to insure that. In fact, he was the same guy who said we have to have “an insurance policy” if he gets elected. Had the roles been reversed and it was agents willing to do anything so Hillary would not win, the media would have it in the headlines for weeks.